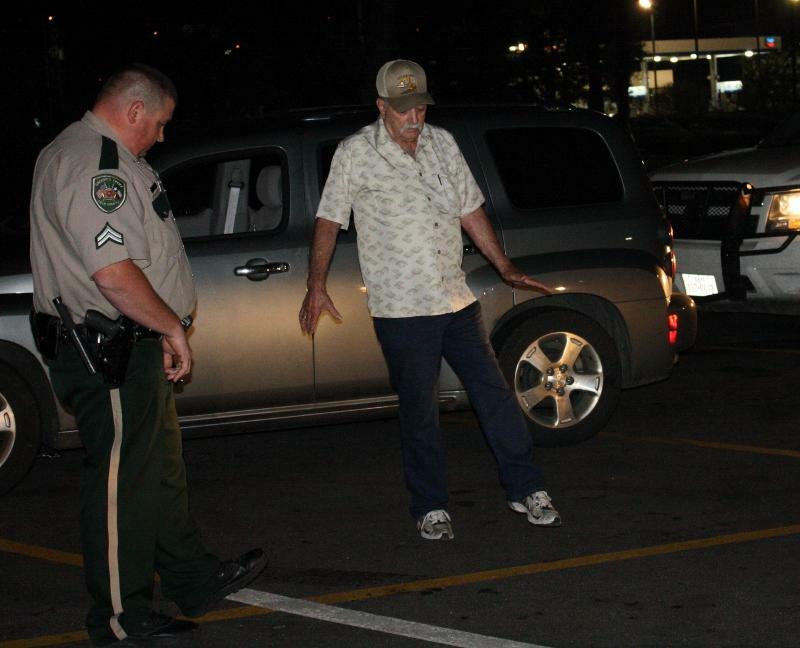 Struggling to walk a straight line: Frank Albert Burton, Jr. of Legget attempts a field sobriety test under the supervision of Coporal Lee Rogers of the Polk County Sheriff's Office. Leggett Man Busted for DWI, LIVINGSTON, December 15, 2011 - At approximately 10:15 pm on December 14, 2011, Deputy Billy Duke with the Polk County Sheriff's Office was on patrol on US-190 West. Duke spotted a gray 2005 Chevy HHR that was weaving. 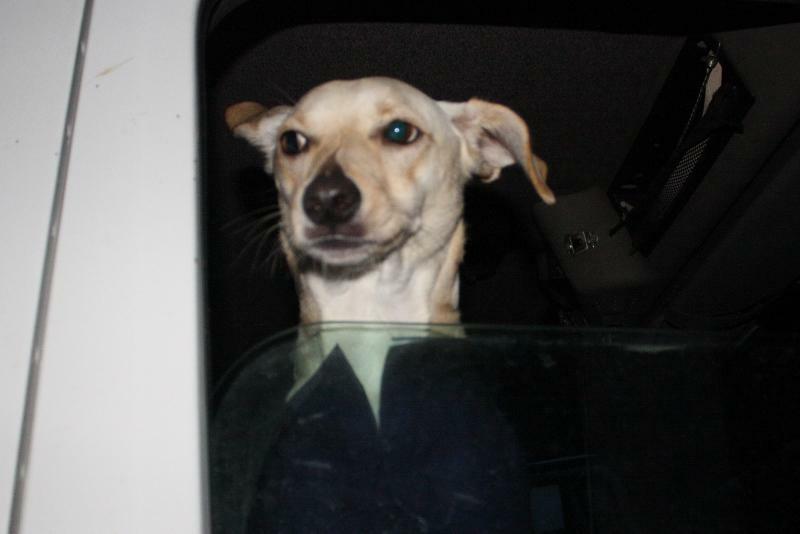 Duke initiated a traffic stop in the parking lot of Wal-Mart. The vehicle was being driven by Frank Albert Burton, Jr., 75, of Leggett. After speaking with Burton and observing him, Duke summoned Corporal Lee Rogers and was soon joined by Sergeant Christian Schanmier. 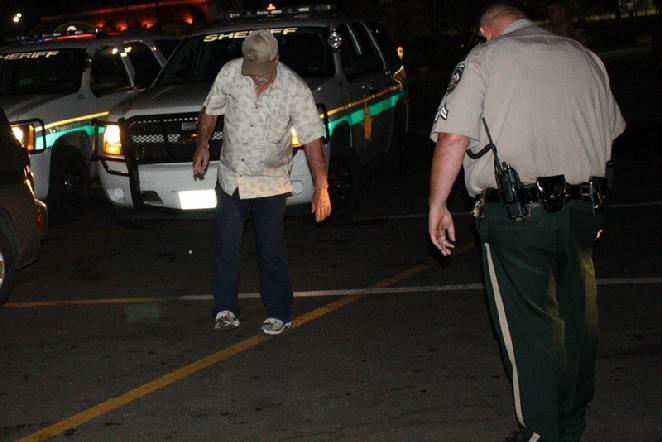 Corporal Rogers conducted a field sobriety test on Burton who admitted to Duke that he had been drinking prior to his driving. 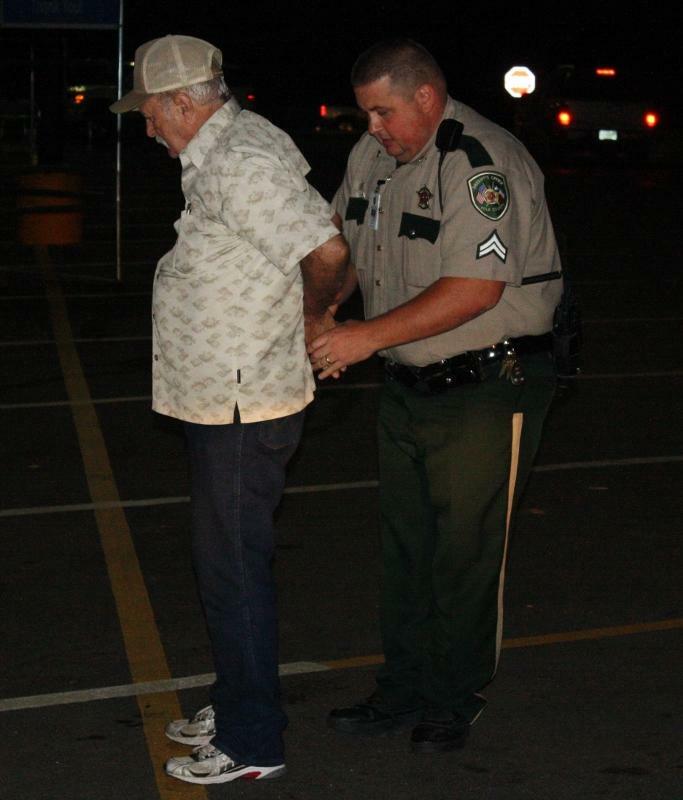 After nearly falling several times during the field sobriety test, Corporal Rogers placed Burton under arrest for driving while intoxicated. A rollback wrecker from Harwood Wrecker Service recovered Burton's vehicle and it will be stored at 101 Harwood Drive in Livingston. The scene was cleared by 11 pm. 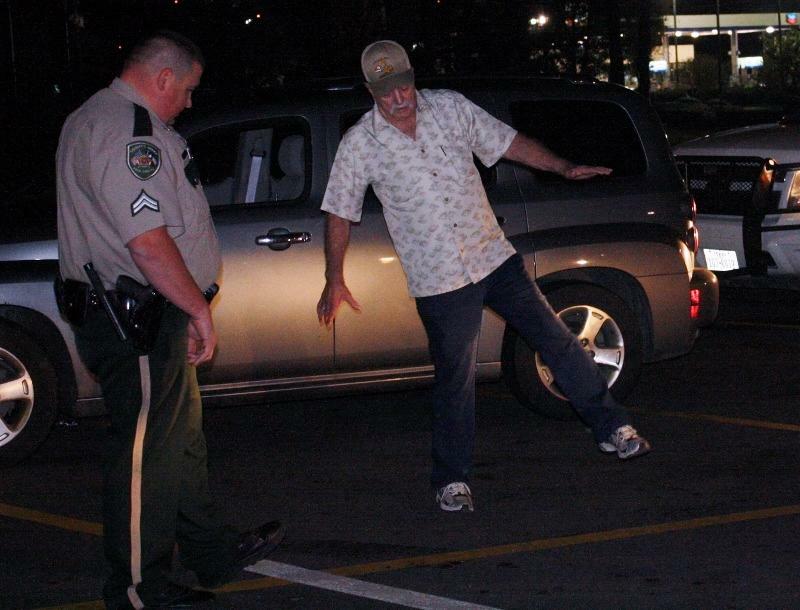 Part of the field sobriety test requires the elevation of one foot six inches off the ground for a number of seconds (Burton nearly fell when attempting the task). Coporal Rogers put the cuffs on Burton and took him to the Big House. Burton's vehicle was recovered by Big Jim Harwood. ??? Houdini was in Big Jim's truck! 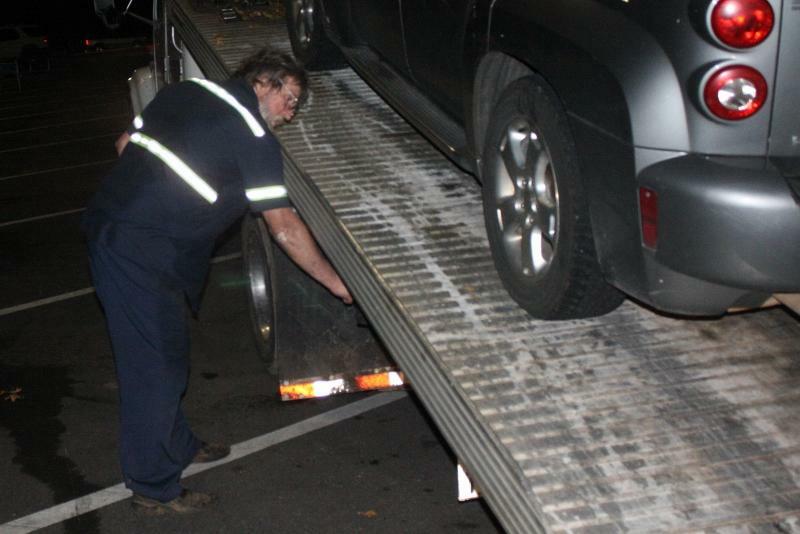 But belongs to Ken's Towing. ?? ?